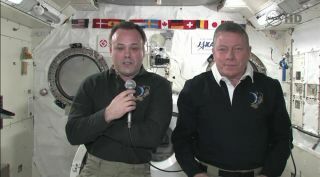 Space station astronauts Ron Garan (left) and Mike Fossum talk to reporters Sept. 6. Two NASA astronauts on the International Space Station are now facing longer-than-planned missions in the wake of a Russian Soyuz rocket failure that has temporarily grounded new flights to space. Astronauts Ron Garan and Mike Fossum told reporters Tuesday (Sept. 6) that they hope the problem with Russia's Soyuz rockets will be resolved soon. The astronauts are part of the station's international six-man crew. "The investigation is still ongoing for what happened with the Soyuz booster," Fossum said. "The whole path from here to launching humans — there's a number of steps along the way: finding the problem, fixing the problem, having a few unmanned test flights. There's a lot of things that have to stack up to make that happen." The current station crew isn't stranded though; those spaceflyers can return to Earth aboard the Soyuz spacecraft they rode up on, which are waiting docked at the outpost. However, without any sure way to launch their replacements, NASA and the Russian space agency have decided to delay those return flights. Garan, along with Russian crewmembers Andrey Borisenko and Alexander Samokutyaev, were originally scheduled to land Sept. 8. Those three will now return to Earth Sept. 15. Fossum, cosmonaut Sergei Volkov and Japanese astronaut Satoshi Furukawa are currently scheduled to come home in mid-November. "It's possible we will have a station without people on it for a hopefully short period of time," Fossum said. "We'll be getting into the details of what it takes to turn out the lights in the weeks ahead. It's too early for us to get too worried about that right now, frankly." The extra time before coming home will allow the spaceflyers to accomplish more science research as well as give ground investigators more time to fix the Soyuz. The astronauts said they have plenty of supplies for the extended stay, even without the shipment that was to be launched aboard the failed rocket. "From a supply point of view we really are in good shape," Garan said. "We've got a lot of water on board, a lot of food onboard, a lot of consumables on board. We haven't gotten to the point yet where we really need to start conserving." The football-field size International Space Station is slated to operate until at least 2020. With the shuttle program finished, and NASA still planning its next missions to deep space, the station is now the primary focus of America's human spaceflight program. Having to evacuate the station, even for a short time, would be unfortunate, the astronauts said, but wouldn't threaten the $100 billion laboratory's legacy or value. "The money that has been spent on the International Space Station — I think history will prove this — is the best investment in our future that we have ever made," Garan said. "The money that's been invested will be returned many times over in new material, new medicines, just improved life on Earth. I think that if we get to the point where we have to un-man the space station, I hope we've already demonstrated at that point how valuable this asset is. I would hope there would be an uproar for keeping it manned."